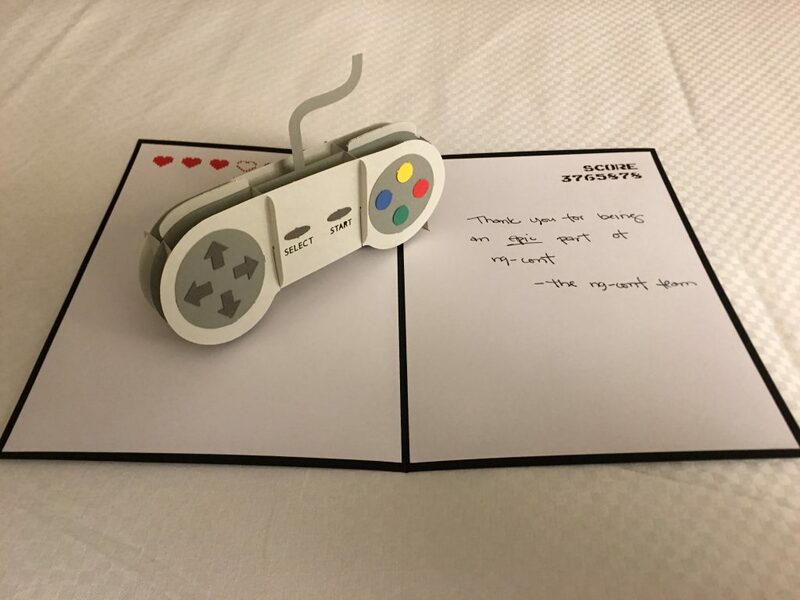 ng-conf 2018 is officially over….too bad it can’t go on forever. It’s such a great conference that you don’t want it to end. In addition to hearing a lot of high-quality talks from the Angular team and other awesome speakers, I had the opportunity to hang out with John Papa a lot (one of my best friends) as well as several other close friends, and made many new friends throughout the week as well (thanks to my buddy Brian Clark for the picture to the right). Here’s a little information about the conference and my overall experience. If you’re only interested in videos of the talks I gave scroll to the bottom to find those. ng-conf had an 80’s theme this year which was a lot of fun. They played 80’s movies like “Back to the Future” in a dedicated movie room, had a Dungeon and Dragons/Star Wars/other games night, gave out a ton of cool swag, had a conference party with an 80’s band, a Back to the Future style DeLorean, and food trucks, did a “Ready Player One” movie night at the theater, and had 80’s video games throughout the halls of the conference center. Plus, the hotel accommodations there are top notch (I stay in a lot of hotels due to business travel so I can vouch for how nice Little America/Great America is in Salt Lake City). What a blast! 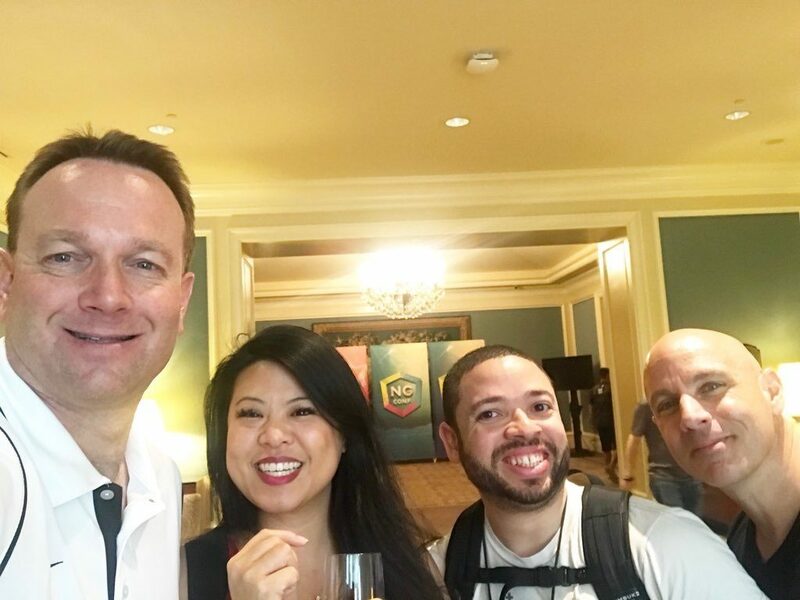 Throughout the week I had a lot of fun discussions with people about tech, life, and more and got to hang out with some devs I’ve worked with while doing training/consulting/architecture (people from J.B. Hunt, Crowne Castle and many others I’ve had in my training classes). If you work with Angular and haven’t been to ng-conf I highly recommend it. If you missed it this year all hope is not lost. You can also attend AngularMix in October at Universal Studios Orlando (it’s an enterprise-focused conference). The Angular team and a ton of great speakers will be there as well and you can hit the Universal parks too…which is super fun! 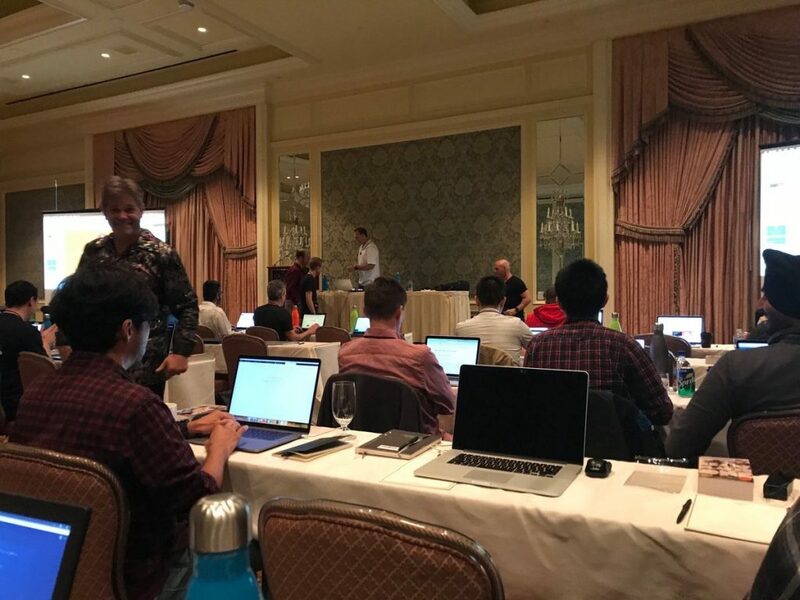 At ng-conf I did a 2-day Angular workshop with John Papa. We had a big group and people were really into the content and asked a lot of great questions. Thanks to everyone who attended the workshop and thanks to Ward Bell and Sander Ellis for helping us out during the workshop labs. The funniest experience at the workshop came from Ward Bell. I decided to take a bathroom break while John was talking and realized I had my mic on me when I left the room….a big “no no” for a speaker since you can never trust the “off” light on the mic (there are plenty of funny stories about this type of scenario so I always avoid any issues). I saw Ward outside in the hallway and asked if he could watch the mic for me until I came back. He was happy to watch it – because he’s just a nice guy. I came back, picked up the mic, thanked Ward and went back into the room (Ward said nothing). As I walked into the room John starts laughing and then the entire audience starts laughing as well. You don’t bring the mic to the bathroom to avoid experiences just like this! If you’ve never spoken before, lesson #1 is NEVER bring a mic into a restroom (which I didn’t). It’s just gross and you never know if it might be on as well….which would be a bit awkward. To continue the story, while I was in the restroom Ward apparently decided to turn on the mic and started singing a song – he’s not real shy and actually has a really good singing voice. John was talking at the time so people were hearing about Angular while Ward was providing some background music. Except….people could only assume I was singing since I had the mic and left the room. John commented that Ward must be in the bathroom with me. It was super funny from what I heard. John said he was laughing so hard that tears were rolling down his face and the audience got a good laugh out of it too. I of course was oblivious to everything until I walked back in the room. Ward always keeps me laughing – such a great friend who I enjoy hanging out with any time. But, I’ll never trust him with a mic ever again. 🙂 There’s a picture of Ward below in one of his glowing outfits. Ward Bell, John Papa, and myself also had the opportunity to speak at a Utah developer meetup on Tuesday night – what a great group! In addition to the workshop and meetup I gave 2 talks at ng-conf as well. 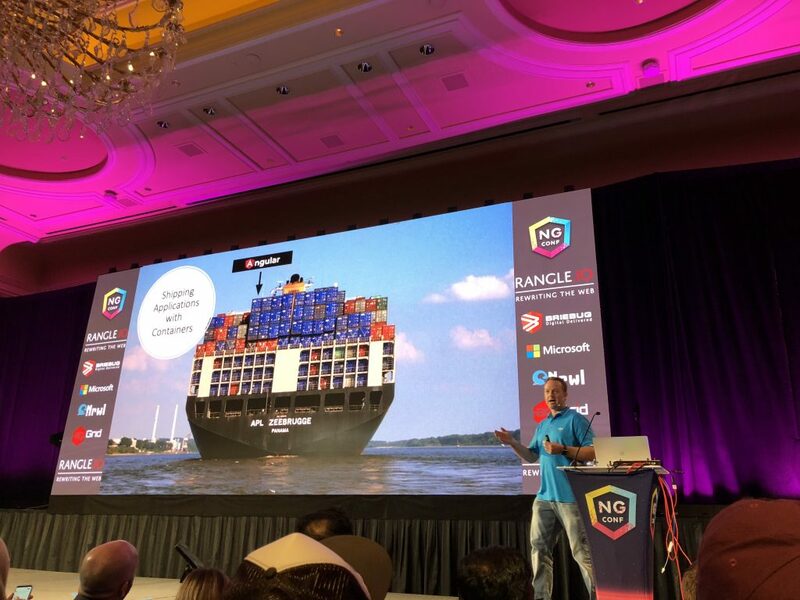 The first was a quick “warm up” talk on using containers with Angular on the main stage of the conference (day 1) that led into my second (50+ minute) talk on different ways containers can be used with Angular and other technologies. You can watch the talks below as well as all of the other talks from ng-conf! Check out the Day 1 talk by my friends Eric and Albert at StackBlitz too. They were right after my Day 1 talk, did a great job, and had a super cool demo that involved 1400+ people in the audience. My overall summary for ng-conf? It’s seriously awesome! Kudos to Joe Eames, Aaron Frost, Kip Lawrence, and Sunny Leggett for putting together another great conference. Thanks to everyone on the Angular team for their time and effort working on the framework and for sharing their knowledge in their talks. Finally, thanks to everyone that came and took the time to introduce yourself to me. I really enjoyed meeting everyone!